2010 September 14 » Change Myself. Change the World. Best thing to do when I get frustrated is find something to laugh about. Easy for me as I am easily entertained. Check out this website if you haven’t already: http://www.thisiswhyyourefat.com/. For some reason it cracks me up. The point is that when you gain a bunch of unwanted weight it is almost never because of lack of exercise or genetics or bone size but because of what and how much you eat. What a fun way to get that point across and then some. People really eat this stuff. 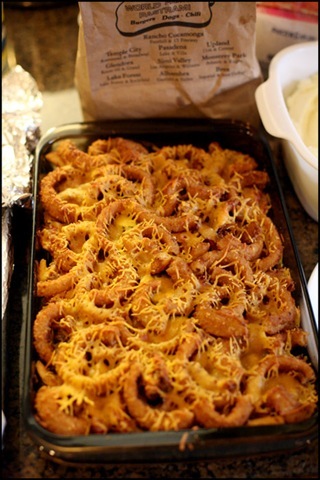 Definitely go check out how this restaurant makes a fries and onion rings casserole. Or Paula Dean’s battered and deep fried butter balls. My favorites on the site are the desserts though. They might be too much even for me. Like Dessert Lasagna or the The Icingcano. UGH! Now that’s just gross. They also have this Oreo Stuff Dip where you take all the frosting out of the middle of a bunch of Oreos and melted it into a dip. Guess what you dip in it? You guessed it more Oreos. Hahaha. Now THAT is not Paleo.